my last few cookies from my cooky book project have been fine, just not ones that will become family favorites but these cookies are so wonderful! they feel like the perfect fall & winter treat! they are spicy & sweet (but not too sweet, just right for you kelly! 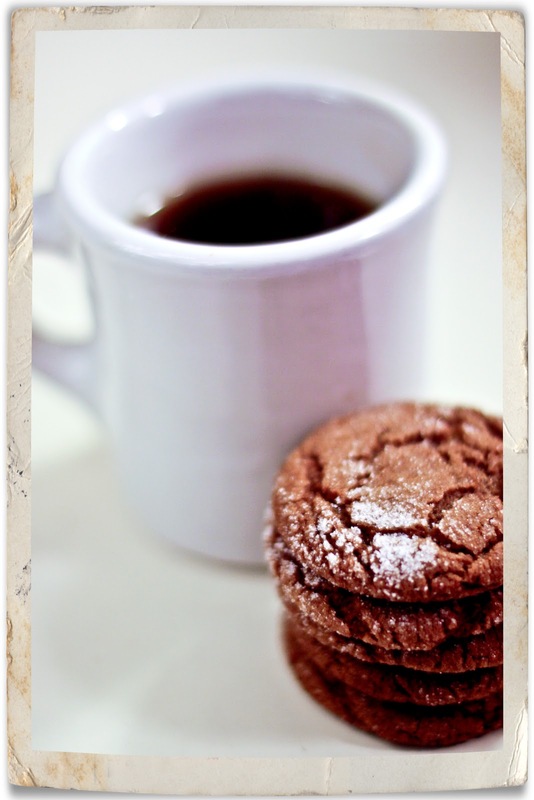 ), very similar to a gingersnap and perfect with a cup of tea or cocoa! mix shortening, sugar, egg and molasses and thoroughly. measure flour by dipping method or by sifting. blend all dry ingredients; stir in. chill. heat oven to 375. roll dough in 1 1/4" balls. dip tops in sugar. place balls, sugared side up, 3" apart on greased baking sheet. sprinkle each with 2 or 3 drops of water. bake 10 to 12 minutes or just until set but not hard. makes 4 dozen cookies. i used butter instead of shortening so my cookies were flatter, crisper on the edges and chewy in the middle...a lovely combo really. i sprinkled water on 1 dozen but skipped it on the rest, it seemed unnecessary. and can i just say again, i love these cookies! These look so yummy! May have to do some baking!